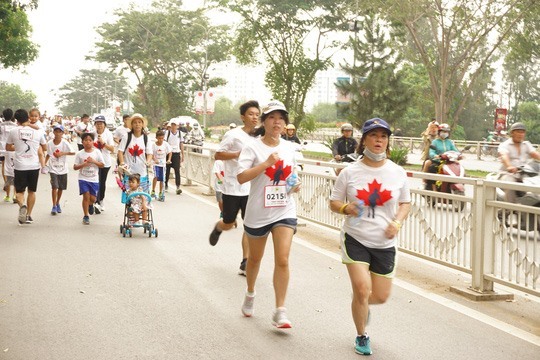 HCM CITY — Over 24,000 people participated in the 22nd Terry Fox Run – a non-competitive five kilometre charity run – in HCM City on Sunday. The event raised nearly VNĐ3 billion (US$129,000) which will be donated to cancer research and developing cancer facilities for Việt Nam’s hospitals. According to Kelly Wong, co-chairman of the Terry Fox Run Việt Nam Fund, the event unites tens of thousands of people each year to raise funds and support Terry Fox’s dream of finding a cure for cancer. Starting in Canada in 1981, the charity run is named after Terry Fox, an athlete who ran across Canada in the Marathon of Hope in 1980, aiming to raise funds and community awareness about cancer treatment. Fox was a cancer patient, and ran with an artificial leg. Terry Fox Run is now held in more than 60 nations worldwide. As a non-competitive community event, Terry Fox Run Việt Nam is open to every individual, family and group, regardless of age. People can choose to participate by walking, jogging or cycling.